Thomas mysteriously wakes up in a metal lift with no memory of anything but his name. When the metal doors open, he is greeted by a rag tag group of young men. The young men explain that Thomas has arrived in the “Glade,” which is part of an enormous maze. The person who has been in the maze the longest was dropped into the Glade two years ago, followed by dozens of other boys. The boys spend most of their days cultivating food and surviving. A select few run the mazes and create maps. The maps are then analyzed for patterns, but not have been discovered thus far. Thomas soon makes a friend named Chuck, but the other Gladers become suspicious of him when a young girl is delivered by the metal lift shortly after his arrival. She carries an ominous note, and seems to recognize Thomas before she lapses into a coma. After surviving a night out in the maze with terrible monsters called the Grievers, Thomas begins training to become a runner. 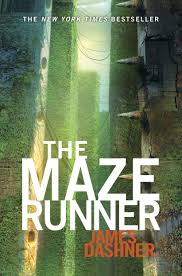 He enlists the help of the girl and his new friends to discover the secrets of the Glade and determine a possible escape route out of the maze. Dashner has an extremely simplistic writing style that seems well suited to reluctant readers. Despite the violence enacted by the Grievers, the rest of the book is rather tame and there is little for challengers to object to. I would go so far as to recommend this book to middle school readers, as I believe their reading comprehension would be adequate to get through the story. The story is not particularly long, and it is fast paced, which lends it more desirable qualities for reluctant readers. There is no soppy romance to deter teen boys from reading it, but it would still appeal to girls who enjoy stories of adventure. After reading the book I watched the movie adaptation, and I was surprised by how well the story translated onto the screen. I suppose most elements of the book could easily be included in a relatively short time frame. Reader’s Annotation: Thomas cannot remember anything about himself when he is dumped into a mysterious maze. Somehow his arrival seems to have upset the delicate balance that has ruled his new home for years, and he must desperately seek an escape route if he is to survive. James Dashner, best known for his Maze Runner series, was born in 1972 in Georgia. He currently resides in the Rocky Mountains, where he writes his novels and runs a social blog. His books series has become a bestseller, and is currently being adapted into a film series. The first film installment was released in 2014. Describe Thomas’ feelings when he realizes he has no memory of his previous life. Describe Thomas’ feelings when he sees a Griever for the first time. Justification of Selection: This is a popular teen book that will appeal to reluctant readers because of its lower reading level.